In 1980, racers had a hot, hot, hot race! With temperatures soaring well into the seventies, almost ten percent of the racers did not finish. Gary Henry won that year with a time of 2:13:14. 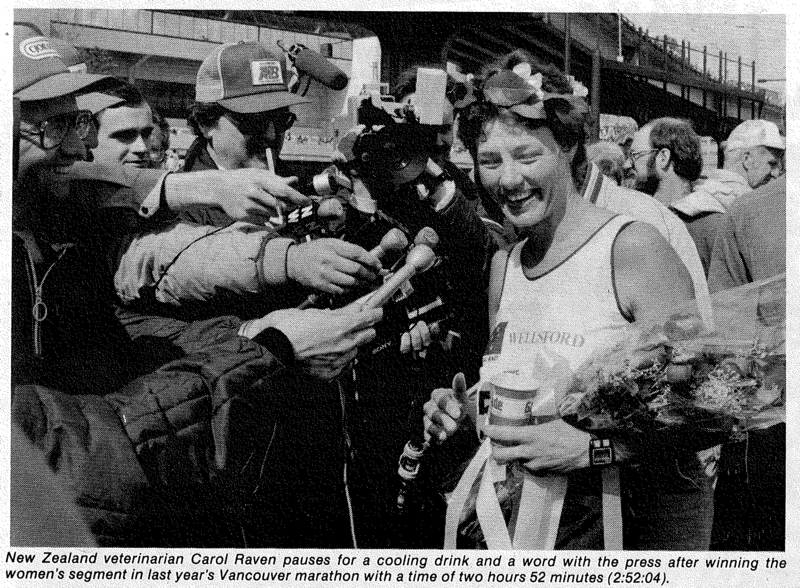 In 1981, Australian Brian Morgan won in 2:16:27, while local Nancy McLaren was the first woman to break the tape in 2:48:23. In 1982, Vancouver’s own Steve Pomeroy cruised to victory with a dominating race margin of nearly seven minutes at 2:16:56. Meanwhile Sue Krenn from California took the top female spot beating local Paula Pick by a mere two seconds at 2:45:25. 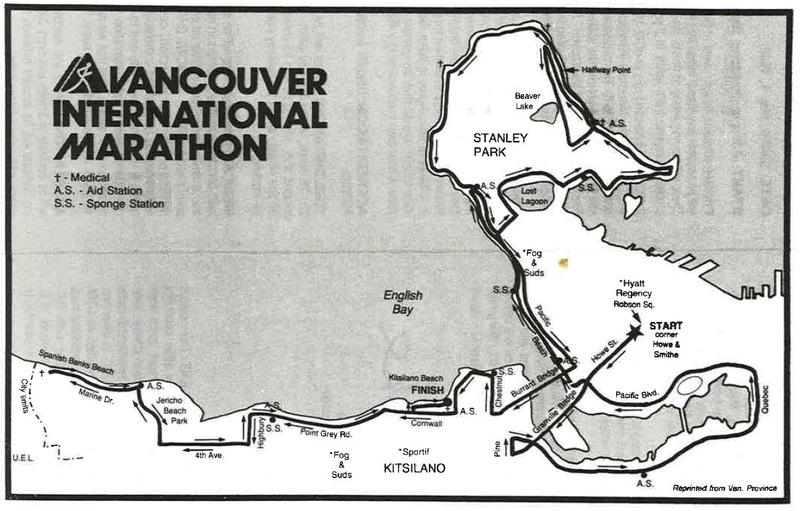 The 1983 race is remembered as the “long marathon” after a spotter at Brockton Point in Stanley Park misdirected runners for an extra 561 yards! Nevertheless, Toronto’s Paul Bannon won the race in 2:19:42. 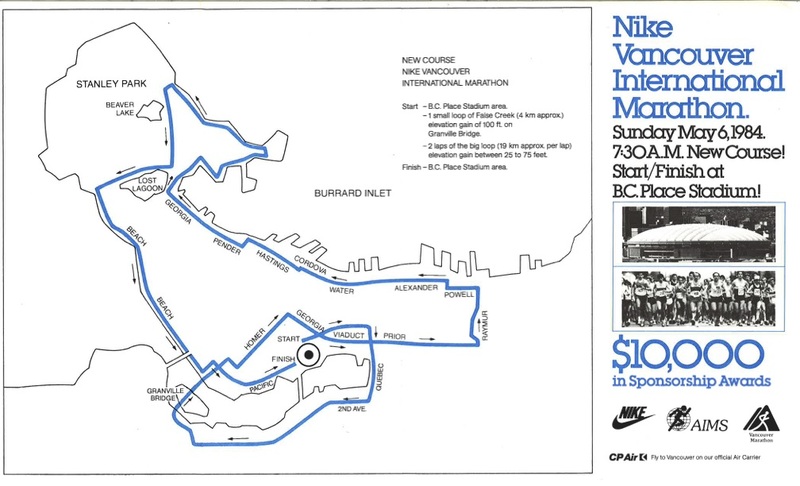 1984 was a milestone year as prize money was offered for the first time, and a new race course starting and finishing at BC Place was established. Ric Sayre of Ashland, Oregon took home the prize in the men’s division with a time of 2:16:34 and Carol Raven of New Zealand won with a time of 2:52:03. 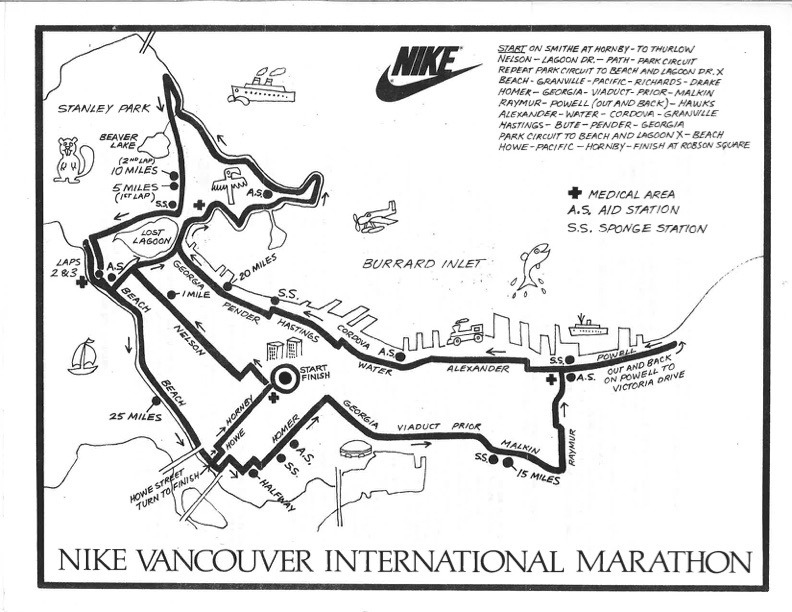 In 1985, four marathons were planned in British Columbia alone. With new race options and a declining economy, sponsors became a rare breed. Despite rumours that the VIM was folding, the race ran as scheduled with Adrian Wellington of Australia winning with a time of 2:24:24 and Kikue Teshima, the first female Japanese winner, completed the course in 2:55:34. Two days after the opening of the world’s fair, Expo ’86, the VIM hosted its largest race yet with 2,400 participants on a new race course. 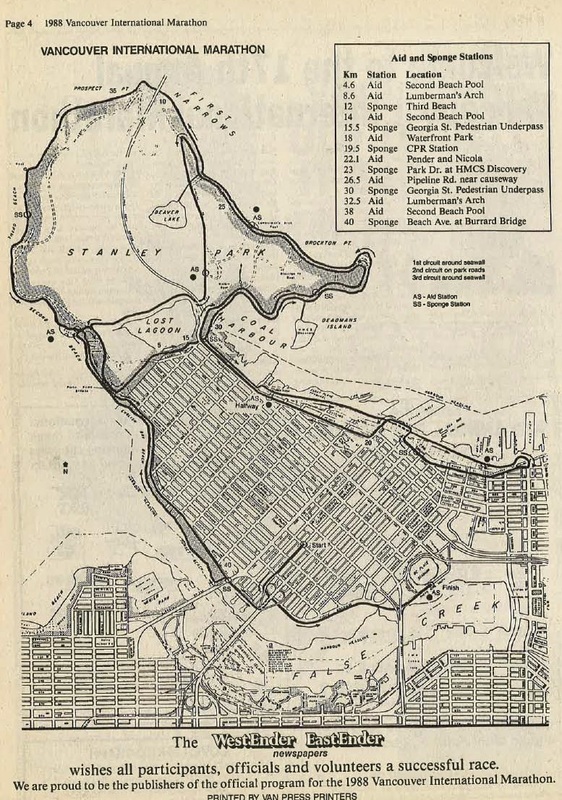 For the first time, the start and finish line were at different locations beginning downtown and ending at Kitsilano Beach. 1986 marked the start of a three year Japanese winning streak on the men’s side with Hiromi Nishi winning in 2:21:14. Saskatoon’s Joi Belyk won the women’s title in 2:45:37. Japanese runner, Tetsuji Iwase won in 2:21:12. Washington State’s Cathy Kroll took the top female spot in 1987 with a time that qualified her for the Olympic trials (2:46:50). For the third year in a row, a Japanese male took the win. Mitsumasa Matsuyama finished first in 2:19:20, while Canadian Isabelle Dittberner won the women’s marathon title in 2:50:33. Students took the top spots in 1989. Thirty-year-old University of Oregon student Shermi Sabag broke the tape for the men and 29-year-old Anne Mangai, a Ph.D. student from the University of Alberta in only her second marathon, took the women’s title.